"The Curious Case of Bizarro Superman"
The Insurgency takes a major loss when Bizarro intervenes with one of their terrorists attacks. He quickly proves more than the Flash Rogues can handle, slaying two of them, before flying off. This latest defeat brings Catwoman to the conclusion that the Insurgency cannot win, and she leaves the group for places unknown. Story - 4: The only thing keeping this issue from being a top score, is that it was Bizarro dealing out the death and destruction, as opposed to Regime Superman. It also slacks in that area, as Bizarro is a misdirected figure because of his nature, a being who is doing what he believes to be correct, but is never quite going to get it right due the foundations of his character. However, Bizarro displays the no nonsense attitude one would expect Regime Superman to have. If Regime is willing to throw the Parasite into the sun to be done with him, then this lot deserves equal expediency. There's been too much waffling with his character since Year Two, and Bizarro's actions here make that quite plain. It's queer to think that Bizarro would show more steadfast direction than Regime Superman, and in such a short appearance, but he's on the right path. "Crush your enemies, see them driven before you, and hear the lamentations of their women"... or something like that. The best part of the issue was Catwoman's departure, which while tied to the video game, was one of the rare instances where the motivation of the character was organic outside of the game. 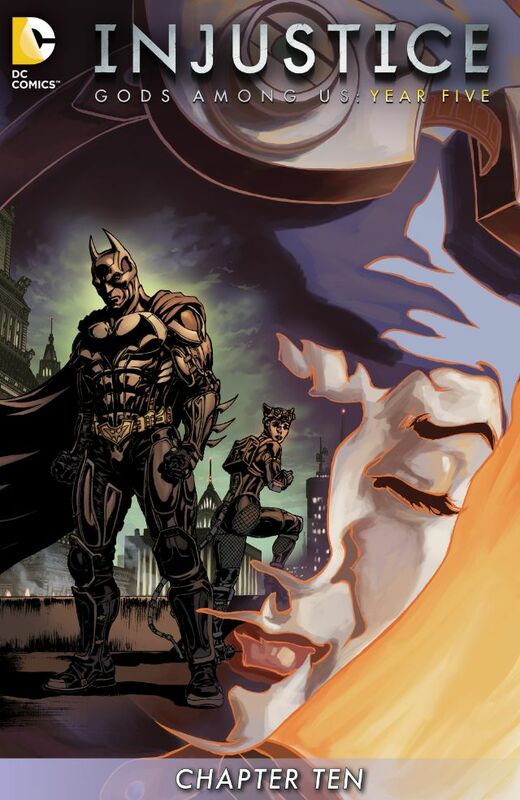 Catwoman has been with the Insurgency from the ground up; she's been there for Bruce Wayne, not Batman. She's been on the run for him, fighting against great odds, captured and tortured for his cause. Catwoman is no one's punk; she's one of the toughest characters out there, and if she's ready to walk, that's saying a great deal. Of course her offer to run away would be rejected by the Batman, but on the other hand, especially with the new round of deaths that have occurred, what other than rigid ideology can the Batman offer her or anyone else on his team? The green pills are nearly gone, the Regime is as strong as ever, and at some point being alive and well sounds much better than the opposite. Two issues in a row that didn't let a man down. Let's hope for a third. Art - 4: The closing pages of the issue, where Batman has to face the Insurgency, knowing how much he's failed them, are excellent.